So I know a bit about the evils of technology and media, and personally, I know how I get sucked in sometimes and lose track of time. But there are some amazing things too. It can bring us closer, it can make a difference. On Sundays, I go to my main Facebook page, and I just screen shot the little photo montage that Facebook puts up under "Friends." I then make that my wallpaper on my computer, and I try to pray for each of the people there by name every day that week. You know, when the computer is booting up or other odd times during the day. This started for me back before Facebook did the photo thing. There would be a semi-random list of eight (I think) of your friends, and at some point, I committed to go check that list every day for a month and pray for everyone by name. Since it was fairly random, that was interesting... I ended up clicking over to some of the pages to remember just who they were. After that month, I tried to keep doing that, but it just didn't happen. 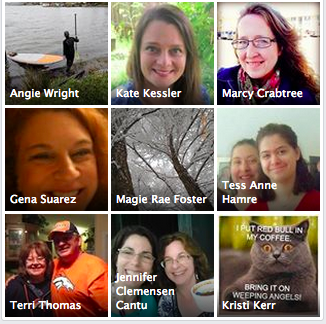 Then Facebook started doing the photo montage bits of friends, and that made a difference. I don't have any idea how Facebook's algorithms work to choose the nine that make it into the montage, but clearly it has something to do with interaction. The downside of that is that I don't see some of my quieter friends at all. The upside, though, is that the people who are in there are almost always people I do know well. Which means on weeks like this one -- for six of the nine people pictured above, I already had some specific something I was praying for them already.